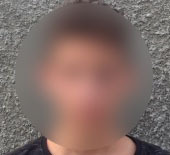 On 28 September 2018, a 13-year-old boy from An Nabi Saleh is detained by Israeli soldiers at 5:00 p.m. on his way to the shops. He is accused of throwing stones and reports being questioned without being informed of his legal rights. He is released the same day. I went to the local shop with my friends, not knowing that at the time, there were clashes between Israeli soldiers and villagers near the military watchtower at the entrance to our village. It was around 5:00 p.m. When I realised there were clashes I stopped to look. Then I heard my cousin yell at us telling us to run because he saw soldiers approaching. I started to run but three soldiers surrounded me. One of the soldiers grabbed me by the shoulder and punched me hard in the face. I fell to the ground and the soldier sprayed pepper spray in my eyes. I felt sever burning pain in my eyes and face. Then the soldier wanted me to stand up and walk but I could not see and I fell to the ground again. Then a soldier grabbed me by the neck and told me to walk. I tried to free myself and run away but I could not. Then a soldier led me towards the watchtower where my hands were tied to the front with 3 plastic ties: one on each wrist and another connecting the two. The tie on my left wrist was very tight and caused me pain because I had fractured it a few months ago. After I was tied I was taken to the back of a military jeep where I sat on a chair. Once inside the jeep I was blindfolded. The jeep drove to the nearby military base where I waited in an open area. I sat on a chair and complained to the soldier about the tight tie. The soldier cut it off and replaced it with a looser tie. He asked me whether I wanted any water or chocolate milk. I asked for some water, I felt I was suffocating from the pepper spray and could not breathe easily. I remained outside for about an hour. Then I was taken to a room and a soldier removed the blindfold and showed me some photographs and asked me whether I knew the boys seen in the photographs. I told him I was going to remain silent. The soldier did not inform me of my right to silence but I knew I had the right to remain silent from a training I attended in the village. He did not inform me of my right to have a lawyer either. When I told him I wanted to remain silent he threatened to take me to the police station. He yelled in my face and swore at god and religion. He told me he wanted to tell the people of An Nabi Saleh three things: first, that we are all terrorists and criminals; secondly, that we threaten the lives of soldiers; and thirdly, they were going to crush us with their weapons. He was so mad that I was scared he might beat me. He asked why we go to the watchtower and throw stones. I told him I was going to remain silent. This lasted for about 45 minutes and I was not given any documents to sign. After the interrogation I was blindfolded again and taken outside. Then I was taken to a vehicle which drove me to Beit El settlement. I needed a toilet but I did not ask because the soldier told me I could not ask for anything until the car stopped. When we arrived I asked to use a toilet but the soldier wanted to accompany me and I refused. At Beit El I was photographed before being handed over to the Palestinian police. The Palestinian police took me to the family protection unit at the Palestinian police station in Ramallah where they took my testimony. Then I went home with the father of the other boy who was arrested with me. I arrived home very late. I had dinner and took a shower and went to bed.